This article explains how to make Hibernate (suspend-to-disk) work on a IBM Thinkpad T20 with no windows installed. 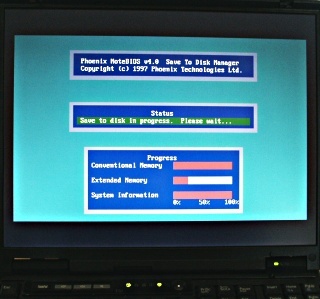 The solution presented here may also work for other Thinkpads with a Phoenix BIOS but I have tested it only on a T20. fdisk or cfdisk for partitioning your hard drive. dosfstools for creating the FAT16 filesystem. fdisk usually comes with your default Linux install. cfdisk usually comes with a Debian default install. 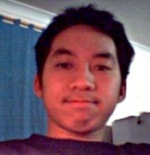 tphdisk was written by Andrew Tridgell for his Thinkpad T20. First you have to make sure that you have a spare PRIMARY block in your device. This is important as Thinkpads only hibernate on PRIMARY partitions, not on extended partitions. Been there, done that. The rule of thumb is: "size of RAM + size of graphic adapter's RAM + extra MBs for safety". If you are planning to upgrade your RAM soon, make sure you take into consideration the size of your future RAM, or else you have to recreate the partition again. Once you have created the partition, set it to type "Hidden Win95 (FAT16) LBA". The partition code is "1E". It is up to you how much extra you want to put in the partition. If you're having problems, kindly refer to the Troubleshooting section. mkdosfs is part of the dosfstools package. ... where hdaX is the partition you just created above (Creating the DOS Partition section). Create the file "save2dsk.bin". save2dsk.bin is the filename of the hibernation file. No, it's not an optional filename. N = size of the file. See rule of thumb above. It is a known problem that the cs46xx sound card driver of the T20 does not re-initialize the hardware registers after a suspend or hibernate operation. In other words Linux will be fully operational but you will not hear any sound after a suspend to ram or suspend to disk. A work around is to run manually "/etc/init.d/alsasound restart" if you care about sound. See also http://panopticon.csustan.edu/thood/tp600lnx.htm#secsnd for more suggestions on how to solve this "sound silent problem". While creating the hibernation file, I received an error says "Write Failed"! Make sure you put enough space in your partition. Try to make it bigger and see if that works. Your thinkpad should be using Phoenix BIOS. When I tried to hibernate, the system just hangs! Your did something wrong! Backtrack and make sure you got everything alright. The partition is an extended (logical) partition. I told you it has to be PRIMARY.